There is nothing surprising that hard drive can get damaged because of many reasons, and the result of HDD damage is usually data loss. We can list numerous factors that may lead to damage or data loss to hard disks, for instance, overheating of HDD, static electricity, lightning, sudden power failure, file deletion, etc. Damaged HDD brings about severe impacts, such as loss of important data, precious photos, sensitive documents, etc. If your hard drive gets damaged or your files are missing, you need to find free hard drive recovery tool to retrieve lost data. If you search online, you’ll find many file recovery companies that can help you retrieve data or partition from hard disks with the assistance of hard disk recovery tools. But software won’t work once head or platters of HDD get damaged. Thus those unprofessional recovery centers are not your best solution. Unexpected power failure damaged file system of hard drive partition, and the result is that partition becomes inaccessible, such as RAW partition. Unknown error happens when hard drive is transferring or backing up data. The alternative of calling file recovery center or HDD repairing shop is finding free hard drive recovery tool and start HDD recovery by yourself. If you are not trained for HDD recovery, then you don’t have to worry. The only training is taking a glimpse of user manual if you find an easy-to-use damages hard drive recovery software. 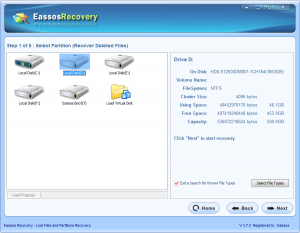 Step 1: Install Eassos Recovery to a healthy hard disk. Step 2: Run the program and select recovery mode. Step 3: Select the damaged HDD and click “Next” to scan it. 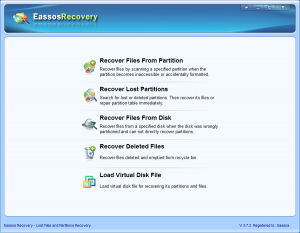 Eassos Recovery is able to scan hard drives which has a few bad sectors. Step 4: Preview and copy listed files. 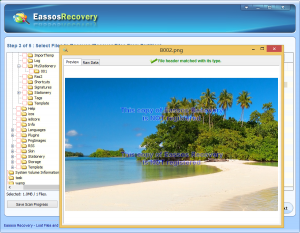 This entry was posted in Data Recovery and tagged damaged hard drive recovery, Free hard drive recovery tool, HDD recovery by EASSOS. Bookmark the permalink.